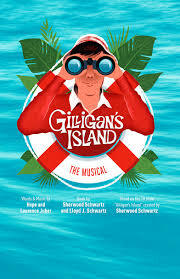 Gilligan’s Island: The Musical is a family-friendly stage musical version of the ever popular and iconic 60’s TV comedy show “Gilligan’s Island”. Shipwrecked on a remote Pacific island, the seven castaways build huts and begin to explore their surroundings. They discover strange hieroglyphics in a spooky cave, which speak of an ancient legend. The weather gets rough, Gilligan foils the best-laid of the castaway’s rescue plans…romance develops…the castaways have an out-of-this-world encounter…it’s fun, wacky and entertaining with 18 original, tuneful and memorable songs.